As promised my sister has written another guest post for me all about her running efforts. I hope you enjoy it and feel a bit inspired to get out there and try it - I might even have a go myself! This next blog is all about my efforts in training for a half marathon- Hope you enjoy it! Date: Several months before Xmas: - For some insane reason, I decided it would be a good idea to enter another race – It had been several years since my last foray into long distance running and I had clearly forgotten what it was like! In addition, I was five years older, about 1 ½ stone heavier and now had disabilities resulting from two badly broken ankles. I had been keeping fit mainly by cycling but I was finding it difficult to lose the weight as effectively as running could do. I had done a few ‘Race for Life’s’ in between but they are all 5k races which didn’t really fit the bill. 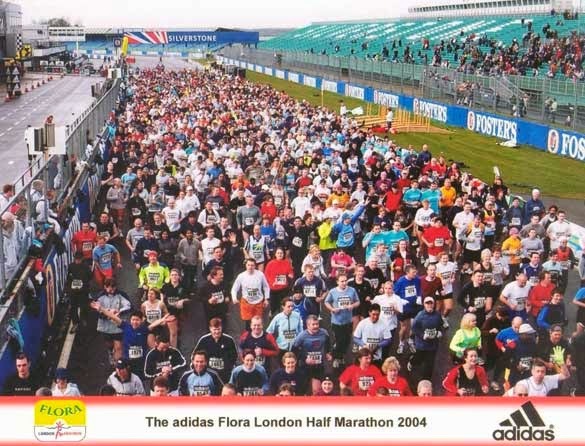 I had once completed a marathon (in 2008), but the words ‘Never again’ had been uttered after that and the memories of the after race effects were still there. So I decided to do a half marathon – which mentally, is much more do-able (and its all about mental belief for long distance running!). So I entered the Silverstone Half Marathon which takes place on the 3rd March 2014 around the F1 circuit. Several moons passed and Christmas,with all its eating and drinking and then, along with half the population, I start a Diet on the 1st Jan – I also dig out the ’12 week training plan’ I had printed it off the internet some while ago and, to my horror, I realise that I had actually only 8 weeks to go until the race!! EEK- I was already 4 weeks behind plan!! Week 2 (5!) 4 x 4 miles to run and a 6 miler on the Sunday. I had to try and fit in some running during my lunch hour as I work in London and I’m out of the house for 12 hours a day- so running in the evening is difficult as a) its dark and I live in a village with no lights down the road, and b) I can’t be arsed. 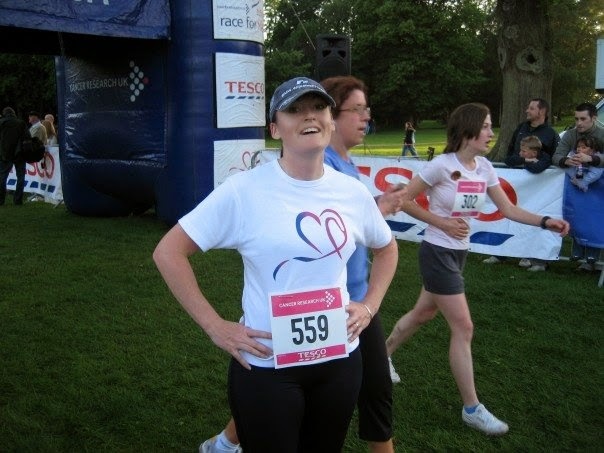 Sharon in 2007 completing a race for life! I found a lovely quiet route in London which took in Tower Bridge, round St Katherine’s Dock and down to Wapping. There are some lovely docks that all the city runners go round. I had to keep stopping to walk for parts of the run as my legs were now fully complaining! The only downside to lunchtime running is the bad hair and beetroot face look for the afternoon! Weeks 3 and 4 - I’m now running 5 times per week and my long-run on a Sunday is up to 8 miles. I’ve been a bit worried about shin splints as I’ve had stress fractures in the past (I’m not really designed for running, I have flat feet and run heavily). I’m running around 20 -25 miles per week. Hopefully it won't get any worse, but I’ve probably over-trained due to starting the programme 4 weeks in. I’ll stick with it and see how it goes. At the end of Week 4 I miss the Sunday run (mainly due to a hangover and the worst wet and windy weather known to man) I got stuck on the sofa by the fire (it happens). The downside to this was that I then had to go for a 9 mile run on Monday evening! Ouch – I didn’t get home until 7 and then I set off (with lovely Husband to keep me company) for an hour ½ run! My sister was in shock at the thought of that much exercise in one go. It was fairly easy except the last two miles where my legs really felt like lead. I had turned the corner though;- the corner where you no longer actually get out of puff…all the pain is only muscular etc (Hint: Ibuprofen is your friend – before and after runs). At the end of week 5 however, I go off to Nice for a weekend of DIY in my apartment. I also managed to do a 4 miler and a 9 miler. It was a pure delight to run in the warm sun and have the sea to one side of me and snow capped mountains to the other. It was a real lift. Week 6 – Pretty uneventful – One good thing however, is that I’ve lost 12 lbs in weight since this started and lots of inches from my waist and legs…feeling really fit too. Week 7 – Disaster strikes!! I get Cystitis….. For those who have ever had this, then you will know that running is a NO GO!! I managed to get through the week on pain killers, did an agonising 3 miler on the Saturday and did a 2 hour walk on Sunday instead of my long run. Week 8- Monday -08.45 – I’m battering down the door of the Doctors to get some antibiotics! I’ve still not able to run since last week and the race is only 6 days away. I spend Monday and Tuesday cycling at 9.30 in the evening (as super busy at work, a horse to look after etc). Luckily by Wednesday, I’m feeling a lot better, so I try a test run of 3 miles…still not perfect but I should just about be okay to run. A totally drunken and mad Friday night was perhaps not the best preparation (but I’m blaming Tasha for that one!) as I stagger around a 4 mile run on Saturday with a monster hangover…. Sun 3rd March- Race day dawns…..the weather forecast was not great – driving wind and rain (what else is new?). We also have to be at the racetrack by 10.30 so it’s an early start. As with most racetracks, the wind is always even stronger than everywhere else. It was also bitterly cold. I went with two friends, Sarah and Caroline, but Sarah is much quicker so she ran her own race, whilst Caroline ran with me. We have run together in the past so know we are at similar standards. We had a laugh at some of the characters in the race. There were 11,000 entries and there are lots of funny costumes… Banana-Man kept up alongside us most of the way, but we beat the Sheep on the line! Collected our lovely medals and the usual goody bag (filled with sweets, energy drinks, T-shirt etc) and headed off home. We stopped off and had a large Big Mac and fries which was best food EVER! !